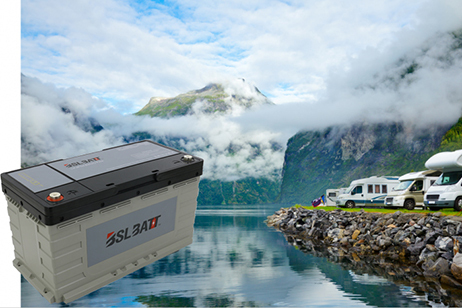 Since the conventional electrolyte partially solidifies at temperatures below 0 ° C, the capacity of the lithium ion battery is drastically reduced when it is operated under low temperature conditions, thus limiting its application under extreme conditions. 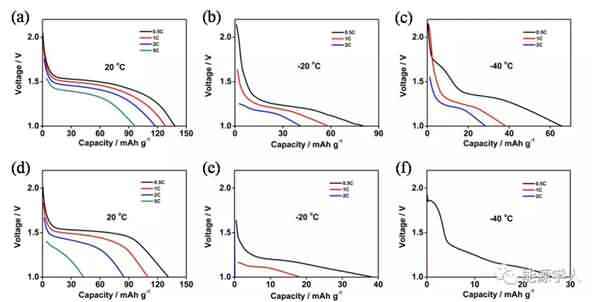 In order to improve the low temperature performance of lithium ion batteries, a lot of research work has focused on improving the conductivity of electrolytes. Figure 1 is a process of synthesizing the additive. Mainly, the ionic liquid molecular chain is grafted onto the polymethyl methacrylate (PMMA) nanosphere by reaction to form a brush-like main structure, and then the structure is dispersed in ethyl acetate (MA). And a new electrolyte system is formed in a mixed solvent of propylene carbonate (PC). As shown in Fig. 2a, the conductivity of the electrolyte decreases as the temperature decreases, and the conductivity of the electrolyte containing ethyl acetate is much higher than that of the electrolyte using only propylene carbonate as the solvent, because The relatively low freezing point (-96 ° C) and viscosity (0.36 cp) of ethyl acetate promote the rapid movement of lithium ions at low temperatures. It can be seen from Fig. 2b that the viscosity of the electrolyte will increase after the addition of the designed additive (PMMA-IL-TFSI), but the increase in viscosity does not affect the conductivity of the electrolyte. Interestingly, the addition of the additive results in a substantial increase in the conductivity of the electrolyte. 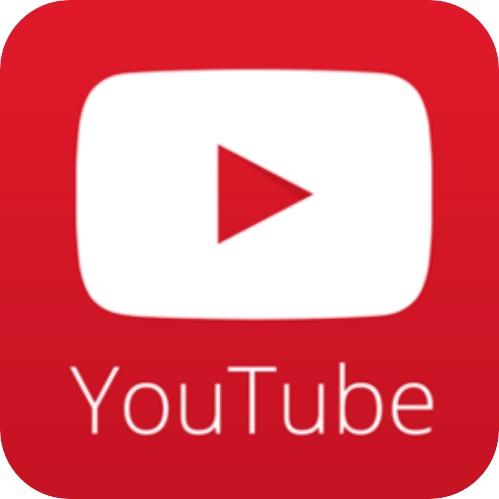 This is due to: 1) The ionic liquid inhibits the solidification of the electrolyte at low temperatures. 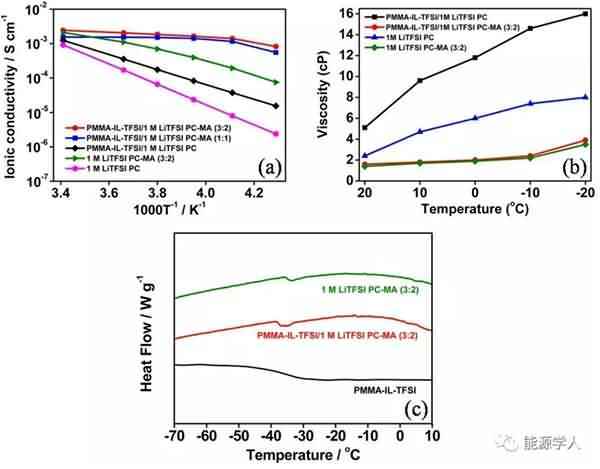 The plasticization effect caused by the presence of ionic liquid reduces the glass phase transition temperature of the electrolyte system (Fig. 2c), so ion conduction is easier under low temperature conditions; 2) PMMA microsphere structure grafted by ionic liquid can be regarded as It is a "single-ion conductor". 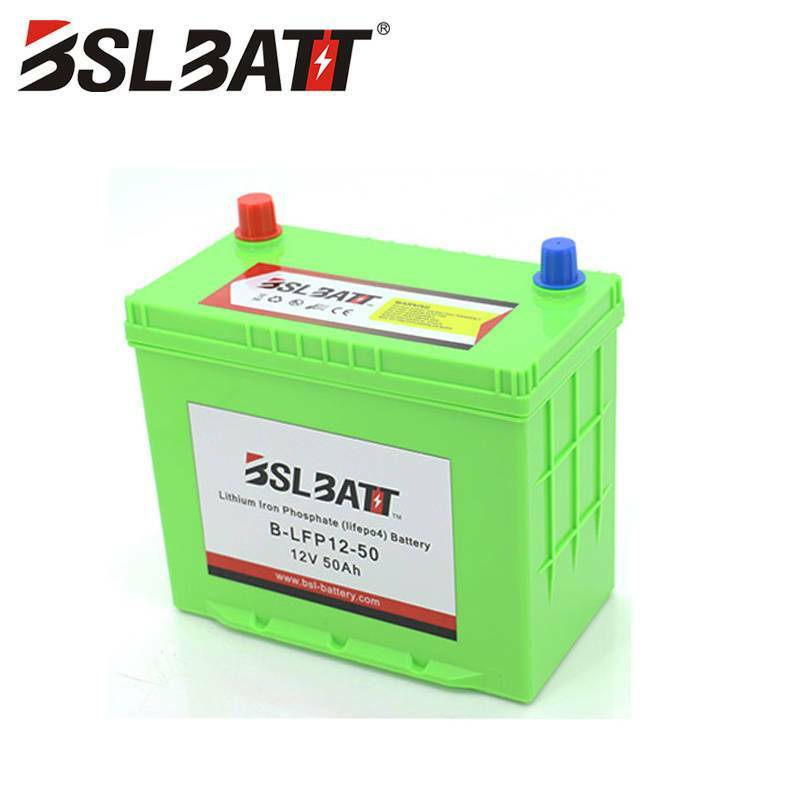 The addition of the additive greatly increases the amount of freely moving lithium ions in the electrolyte system, thereby increasing the conductivity of the electrolyte at room temperature as well as at low temperatures. Figure 1. Synthetic route for additives. Figure 2. (a) The conductivity of the electrolyte as a function of temperature. (b) Viscosity of the electrolyte system at different temperatures. (c) DSC analysis. Subsequently, the authors compared the electrochemical performance of two electrolyte systems containing additives and no additives at different low temperature conditions. It can be seen from Fig. 3 that after circulating 90 cycles at a current density of 0.5 C, there is no significant difference in the capacity of the two electrolyte systems at 20 °C. As the temperature is lowered, the electrolyte containing the additive exhibits superior cycle performance than the electrolyte without the additive. At 0 °C, -20 °C and -40 °C, the capacity of the electrolyte containing the additive after cycling can reach 107, 84 and 48 mA / g, significantly higher than the capacity of the electrolyte without additives after cycling at different temperatures (respectively At 94, 40 and 5 mA/g), and the coulombic efficiency after 90 cycles of the electrolyte containing the additive remained at 99.5%. 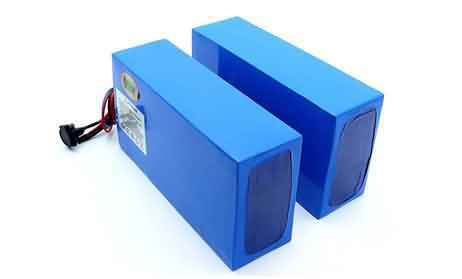 Figure 4 compares the rate performance of the two systems at 20 ° C, -20 ° C, and -40 ° C. A decrease in temperature causes a decrease in the capacity of the battery, but after the addition of the additive, the rate performance of the battery is greatly improved. 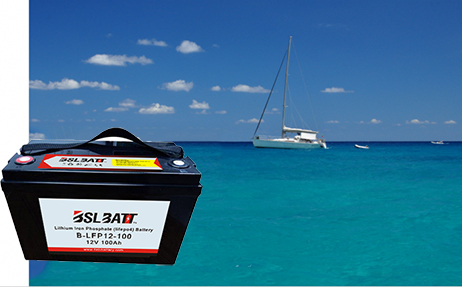 For example, at -20 ° C, the battery containing the additive can still reach a capacity of 38 mA/g at a current density of 2 C, while the battery without the additive is not working properly at 2 C.
Figure 3. 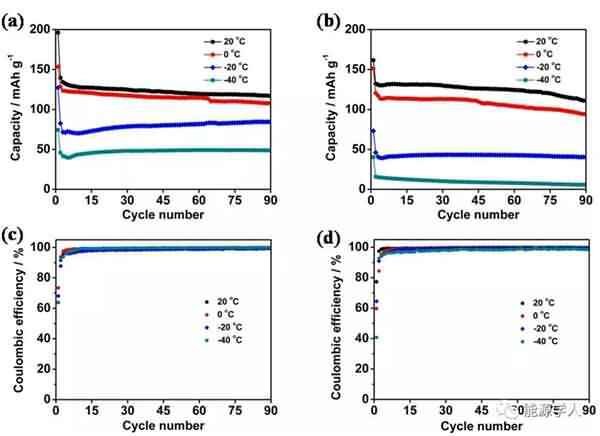 Cyclic performance and coulombic efficiency of the battery at different temperatures: (a, c) electrolyte containing additives; (b, d) electrolyte without additives. Figure 4. 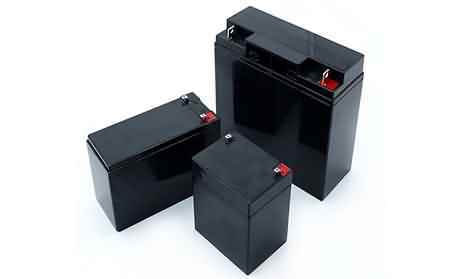 Rate performance of the battery at different temperatures: (a, b, c) electrolyte with additives; (d, e, f) electrolyte without additives. Finally, the authors further investigated the underlying mechanisms by SEM observation and EIS testing, and clarified the possible reasons for the presence of additives to make the battery exhibit excellent electrochemical performance at low temperatures: 1) PMMA-IL-TFSI structure inhibits electrolyte solidification and Increasing the amount of freely moving lithium ions in the system makes the electrolyte greatly increase at low temperatures; 2) the increase of freely moving lithium ions slows down the polarization effect during charge and discharge, thereby forming a stable SEI film; 3) the presence of ionic liquids The SEI film is made more conductive and promotes the passage of lithium ions through the SEI film, as well as rapid charge transfer. It can be seen from Fig. 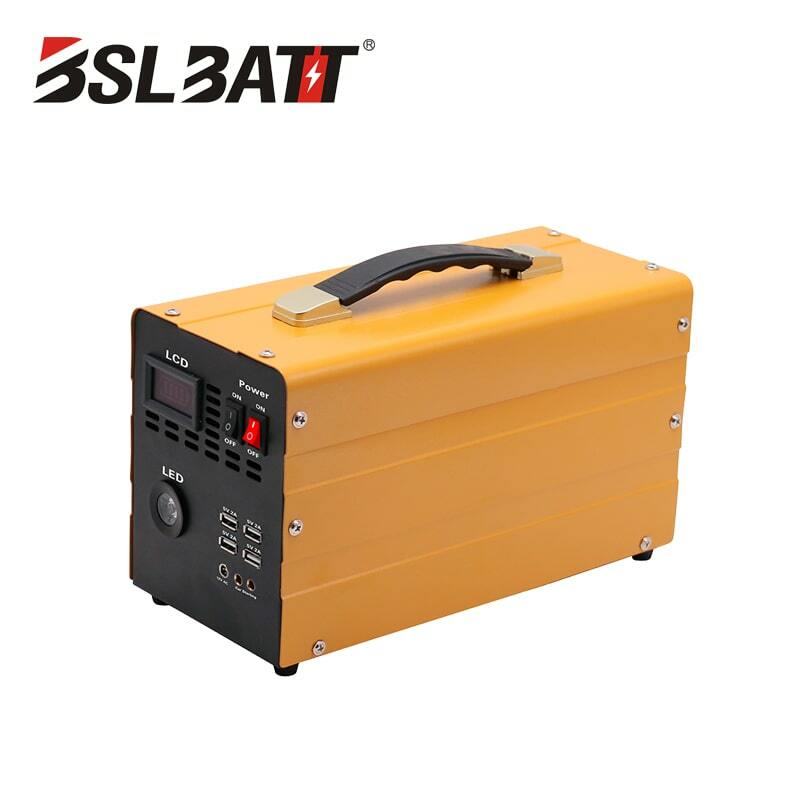 5 that the SEI film formed by the electrolyte system containing the additive is more stable and firm, and there is no obvious damage and cracks after the cycle, and the electrolyte and the electrode are further reacted. By EIS analysis (Figure 6), in contrast, electrolyte systems containing additives have smaller RSEI and smaller RCT, indicating less resistance of lithium ions across the SEI membrane and faster migration from SEI to the electrode. Figure 5. SEM photo of the lithium sheet after the end of the cycle at -20 ° C (a, c, d, f) and -40 ° C (b, e): (a, b, c) contains additives; (d, e , f) contains no additives. Figure 6. EIS test at different temperatures. 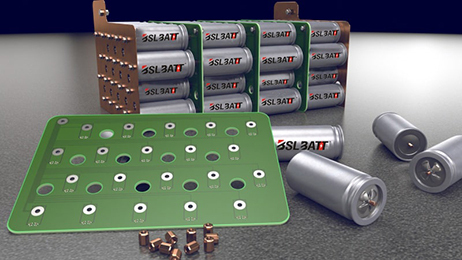 The article was published in the internationally renowned journal ACS Applied Energy Materials. The main work was completed by Dr. Li Yang, the first author of the paper.